This needs careful planning to ensure that there is enough space for a wide range of family activities. Sun loungers and deck chairs need space not only for themselves but for the free movement of people around them. An idea of how many people are likely to need sun loun­gers at any one time will give a good indi­cation of how large the patio should be. A scale drawing and some trial and error will be helpful in assessing this and the eventual shape of the patio although, very often, financial considerations modify the ideal layout. The amount of space needed for dining chairs around a table may also need assessing, bearing in mind that people will need to move the seats outwards in order to sit down. Most paving materials are expensive. 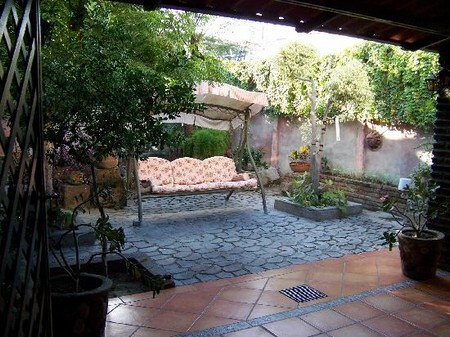 There are often places around some edges of the patio, particularly against walls or fences, where it is not really possible to walk or sit on the paving. Here it may be prudent to have planting spaces so that the plants can help to ‘soften’ the walls and make the patio a more inviting place to sit. 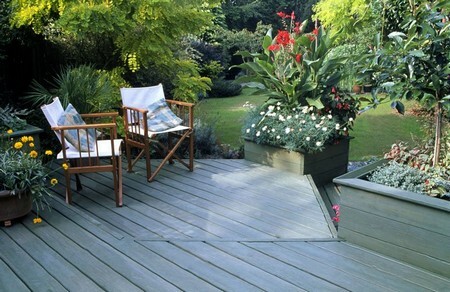 If paving is laid right up to walls and fences, tubs and pots of plants can achieve a similar softening effect. The general shape of a patio may also be influenced by the material used to pave it (or the other way about). It is physically awkward and aesthetically unsatisfactory to have a strongly curved edge running through square or rectan­gular paving units, especially through large slabs. Bricks and small blocks are not so critical but in any event an edging of some type is usually needed, perhaps of bricks. If the patio surface is to be of square slabs, then the best way to achieve shape is to either step it in or out, or to build in some 45° angles. A patio against a house should always start below the damp proof course. On modern houses this is usually situated just below door sills. The patio surface should be at least 150 mm (6 in) below this point (or below any floor vents). It is normal to slope a patio away from the house to shed rain water. It is very important when planning a patio to predict where its surface is likely to end up in relation to the garden. The normal slope or ‘fall’ on a patio is 1 cm for every metre it extends out. Knowing where on the house the surface will begin, it should be possible to predict whether or not the patio will end up below ground or not. If it does, then some sort of step up onto the garden will be necessary together with some form of drainage to cope with a build up of rain­water in that area. The problem will be accentuated in a garden which slopes sharply down towards the house. If the patio is shaped in such a ‘way as to reach further into the garden at one point than it does at another, then the furthest point could well end up lower in the ground than the rest. The best policy here is to make the step the same height all round regardless of this, and gently grade the garden soil up or down to match. In some gardens it will be possible to manipulate the levels of both the patio and the soil so that they both end up flush with each other. Where the doors in the house are high above the ground, there is a choice of either having steps from the house down onto a low-level patio, or having the whole patio raised, with steps down onto the garden. The latter may look more impressive but will cost more. These always add interest to a patio area but they ought to be a reasonable size, not just narrow troughs, so that they can support a meaningful display of plants. In areas of alkaline soil, raised beds can be filled with acid soil to support ericaceous (lime-hating) plants. Where these are a regular event on the patio, permanent, fixed, wood slat benches can be built in to add further interest and enhance their usefulness. Brick or stone built barbecues do eventu­ally become messy and charred so some thought will be needed in placing these where they are not in constant view. They should also be far enough away from windows to allow space for window cleaning and, of course, far enough away for the smoke not to enter the house. If the area adjacent to the house does not receive much sun, it may be necessary to site the main patio elsewhere. Some paving will still be needed immediately outside any patio doors so, overall, the layout will require more paving than before and, therefore, be more expen­sive. A patio elsewhere in the garden will still need to be a suitable size and, in addi­tion, might need linking to the house with a path. These patios often benefit from a backdrop of planting so that anyone sitting there can feel partly secluded. Patios built right out in the open with no surrounding borders seldom feel comfortable.